These are list of BBB (Big Bad Boys). Blade sizes ranging from 14” and above and combo of large traditional and modern kukri knives for various reasons fall in this category. In Nepal some of these kukris are meant for religious purpose like sacrificing. 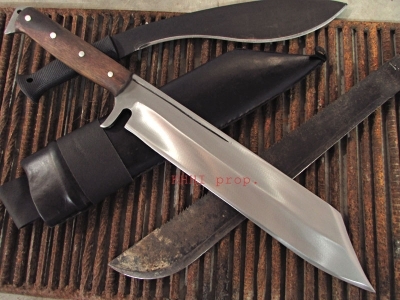 The variety ranges from traditional 18” bladed kukri knives to some modernized to some western style Bowie but built all for the same purpose; decapitate and destroy. 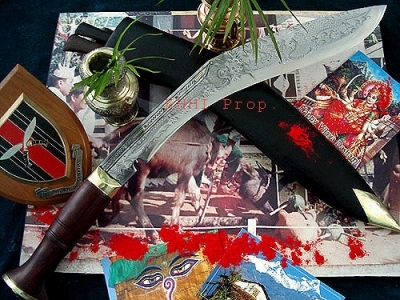 Buff head in this category with 36” long blade is the largest kukri offered by KHHI nepal, magnificently hand forged to amaze people and show the craftsmanship. Hand forged large khukuris are rare finding at Khukuri House Nepal .